It's time to start looking for some new worlds to visit. It sounds like the hackneyed plot to a science fiction movie: a secretive group of billionaires, scientists, financiers, and philanthropists meet to draw up plans for the world’s first interstellar spacecraft. The problem is: this is no cheesy sci-fi flick. This is real life…it’s actually happening, as you read this, in the form of Yuri and Julia Milner’s “Breakthrough Starshot” program, established in April of last year. It falls under the umbrella of the “Breakthrough Initiatives,” an ambitious, well-funded program of scientific research into the big questions. Are we lone motes of intelligence in an awful sea of loneliness, or are there other minds waiting to communicate with ours? Can we reach other worlds? And can our species act in concert to make contact with our brother minds in the universe? And quietly, with the backing of some of the world’s keenest and most innovative minds—Stephen Hawking and Mark Zuckerberg, to name just a few—the Breakthrough Starshot program is drafting the architecture for what some are calling “the Big Jump:” mankind’s first great leap across the gulf of space that separates us from the nearest stars. So far, the plan is in its infancy. There are some technological hurdles to overcome, but with time, money, and plenty of research, there is every reason to hope these won’t prove insurmountable. The idea is simple: build a “StarChip”—a gram-scale nanocraft (roughly the size of a postage stamp) outfitted with miniaturized electronics, cameras, computers and power source—and hitch it to a lightweight “lightsail.” Then use a laser array, or “light beamer,” to accelerate the whole apparatus to something like 20% of the speed of light. That’ll put you in the neighborhood of Proxima b in about 20 years from launch. Optimistically, the team is hoping for an “arrive-by” date of 2060; of course, this all depends on the progress of technology, which encompasses everything from miniaturized electronics and computers, lasers, battery technology, materials science, and really long-distance communications. In the meantime, the Breakthrough Starshot team is making progress on other fronts. It’s not enough to just build an interstellar spacecraft; ideally, you want to know where to send the thing. And that’s why they’ve recently inked a deal with the European Southern Observatory to outfit the Very Large Telescope (VLT) with some potent instrumentation to scan the Alpha Centauri system for potentially habitable—or at least interesting—planets. Observations are expected to begin in 2019. 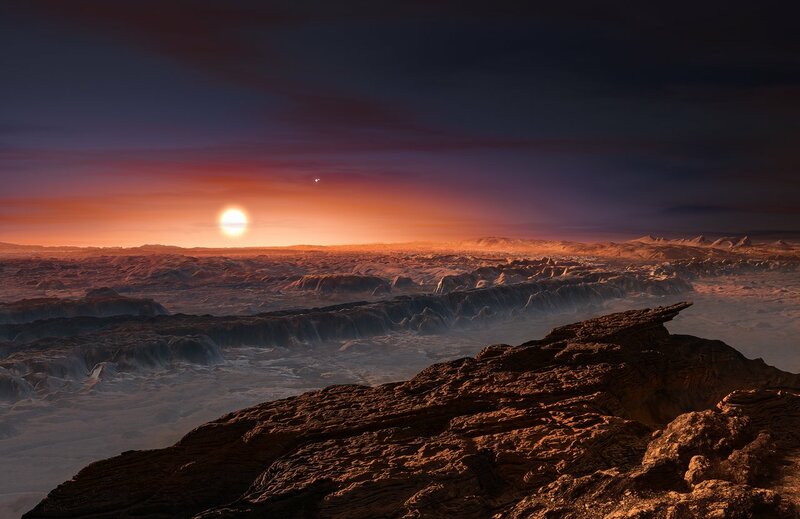 It was the ESO that discovered Proxima b last year, an announcement that injected a great deal of enthusiasm into the Starshot team; the planet is at least as massive as Earth but is likely tidally locked in a close orbit around its red dwarf primary. Given the proclivity to UV flaring of stars like Proxima Centuari—especially in early life—there are serious questions about the planet’s habitability. These questions are why the team wants to adapt the VLT to search for planets in the Alpha Centauri double-star system. Breakthrough Initiatives will pay to upgrade the telescope to make this search possible; they want to install an instrument module built by Kampf Telescope Optics on the VISIR (VLT Imager and Spectrometer for mid-Infrared), which will use adaptive optics to enhance the telescope’s ability to distinguish planetary signatures from the glare of their stars. A coronagraph (used to block stellar light), jointly developed by the University of Liège and Uppsala University, will also be rigged to further enhance the observatory’s ability to detect the tiny specks of planetary light. The objective for Breakthrough Starshot, in the coming decades, is to thoroughly examine the Alpha Centauri system while the technology for the “StarChip” nanocraft is in development. Hopefully, by the time the spacecraft are ready, the team will have compiled a serviceable map of our neighboring planetary system, and will be able to select a promising target and chart their probes an interesting flight plan decades in advance. This is all heartening news for those who are longing for the time when humankind will finally reach out and touch the stars. Slow, quiet progress is being made by the Breakthrough Starshot program; and we can expect further advances in the many scientific and engineering disciplines the project subsumes. We’ve finished the first, cursory exploration of our Solar System, and though there’s still much more to discover, our species—with characteristic restlessness and impatience—looks to further horizons. The Big Jump is the next logical step; we want to see what’s beyond that mountain range ahead, and we’re racing to do everything in our power to scale its loftiest peak and survey the undiscovered country it hides from sight. Of course, getting there—really, physically stepping out onto the soil of the planet of an alien sun—is the great dream, and some of our greatest minds have worked on the heady problem of how to build reasonable starships. Some of their ideas are fascinating and even plausible; some less so. Realistically, our technology is centuries away and at least one step up on the Kardashev scale from being able to send human beings even to nearby Proxima b. But that’s an estimation that recks very little of the notorious variable of human ingenuity; there’s just no telling what marvelous new technologies we might develop in the decades to come. For the time being, we’ll have to content ourselves with tiny probes and—if we’re lucky—maybe a few grainy images of distant planets, pieced together with great effort from a faint signal trickling across 4 light-years.